CBD Provisions is an upscale American Brasserie located in the lobby of the beautiful Joule Hotel in Downtown Dallas. The food can only be described one way.....delicious! One of the immediate perks upon entering the restaurant is the complimentary valet parking, which is very much appreciated when it comes to find parking space downtown. The design of the restaurant is immediately eye catching. Clean lines, decorative art and leather art masterpieces adorn the main dining area. The bar is located inside the middle of the dining room and the menu is full of tasty crafted cocktails suitable for all palettes. The Miro Negroni is one for your must try list, along with Muddy Waters. The service is amazing-everyone is very attentive and the staff is very well versed on all things CBD and will offer to curate your meal and drinks, it's just what they do. CBD also offers a daily crudo option which is an inspired dish for the evening by the chef. While looking at the menu, of course I couldn't help but notice Charred Octopus...hmmm, not exactly what I'd choose.... but the first bite made me a believer! I'd come back for more, tentacles and all. 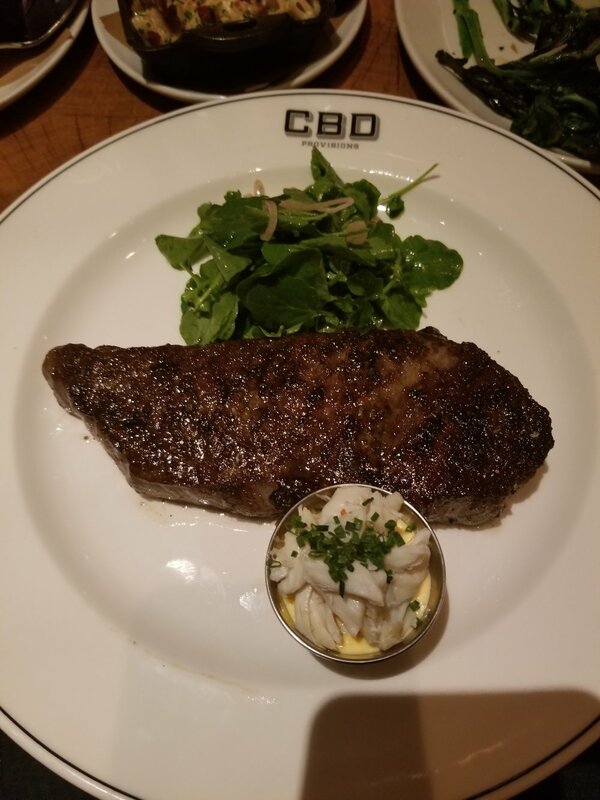 CBD also does steak.......very well. The 12oz NY strip made of Waygu Beef was a hit on my taste buds along with delicious sides of house made shells, creamed spinach and grilled Chinese broccoli. CBD's hours are from 7am-10 pm Monday thru Thursday, open until 11 Friday-Saturday and 9pm on Sunday. Disclaimer: My post is sponsored by CBD Provisions, all opinions are my own.